Orthodontic Care on the Go! Whether you’re heading out for a day with friends or running from classroom to volleyball practice, you don’t always have the luxury of taking care of your braces or aligners in the comfort of your home. But don’t stress! Here are some suggestions for handy items you can take with you to handle most of the dental situations that might come up. Travel Toothbrush—the perfect size for quick cleanings after a meal on the go. You might want to bring a travel size tube of toothpaste as well. Dental Floss, Threader, and Dental Picks—you don’t want something stuck in your teeth or braces through three hours of play rehearsal. Water Bottle—if you don’t have time to brush, a good rinse will help keep teeth and appliances clean. Small Mirror—to make sure your smile is picture perfect after eating. Our office phone number—just in case. If something happens to your braces or aligners, or if you suffer a dental emergency, call our Washington DC office immediately. Orthodontic Wax—if one of your brackets is irritating your mouth, you’ll be ready. 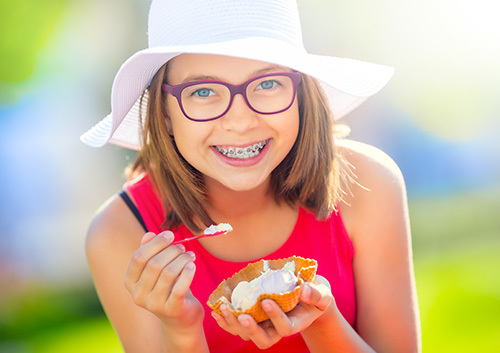 Braces-Friendly Snacks—soft, healthy foods that will help keep your energy up while keeping your braces intact. Your case! If you need to take your aligners or retainer out, use your case to protect them and keep them from getting lost. You have better things to do after lunch than sifting through a garbage can full of used napkins. Much better things. All of these items can fit easily in a case or bag in your glove compartment, locker, or backpack. Want more tips? Talk to Dr. Andrew Schwartz and our team on your next visit, and let’s work together to make caring for your orthodontic appliances a quick and convenient addition to your busy schedule!